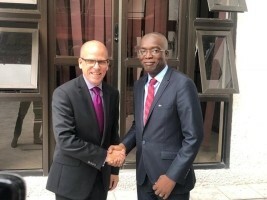 On Tuesday, Edwing Charles, the Minister of Youth and Sports, received André Frenette, Ambassador of Canada to Haiti, to study ways of cooperation between the two countries. After presenting the three sub-sectors of the Ministry: Youth, Sport and Civic Action, the Minister Charles advocated a cooperation focused on the training of sports executives, the implementation of programs for the benefit of young people and oriented towards citizenship. Ambassador Frenette said he was ready to receive the Minister's proposals in line with the Government's priorities and said he was ready to "continue the dialogue towards possible cooperation despite the constraints".